It wouldn’t be an overstatement to say that most of the world subsists on rice. The Italians love their risottos, the Japanese their sushis and sticky rices, the Chinese incorporate rice in various forms in their diet and the Thais relish their Jasmine rice with spicy accompanying curries. As far as Indians are concerned, rice is not just a regular part of an Indian meal (dal chaval being the national dish) but also an integral part of culture, tradition and various ceremonies. 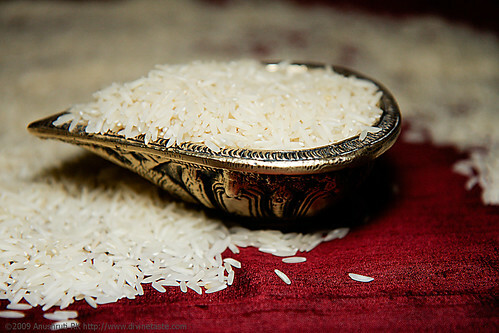 In Indian culture, rice has been accorded an exalted status and is the most revered, worshipped and treasured grain. At traditional Hindu weddings, rice is sprinkled on the newly weds as a symbol of prosperity and fertility. Rice is the first solid food (sweet rice, a mixture of cooked rice, milk and sugar) fed to a newborn during the annaprasanna ceremony. Festivals are associated with the sowing, transplanting and harvesting of rice. Indian folklore and sacred texts are full of stories where rice seeks a mention. 200,000 varieties of rice are cultivated in India alone. 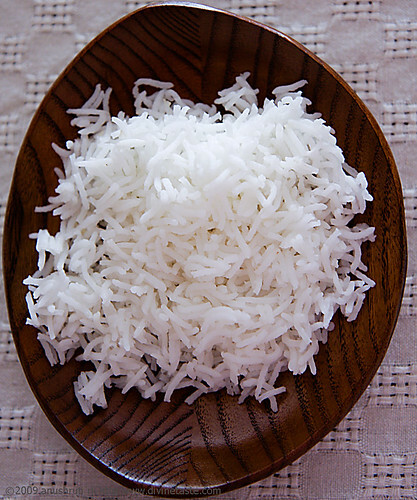 White Rice or polished rice is always used for functions, religious ceremonies and festivals. For instance, no cook would use brown rice to prepare a wedding feast. Polishing grains increases their shelf life but also robs them off their essential nutrients. With the outer bran being removed, it leaves the grain minus the fibre and most of the nutrients. Most Indians are used to eating polished white rice, brown rice or unpolished rice making an entry into the tables of only the health conscious. In rural areas and certain section of eastern and southern India parboiled rice is consumed. I cannot imagine my paternal grandmother eating brown rice as a part of her daily meal and let me tell you that she is an octogenarian who has led a perfectly healthy life. An ayurvedic practitioner mentioned to me that white rice is much easier to digest and is lighter on the stomach than brown rice. When combined with proteins in the form of lentils, dried beans, nuts or dairy products, rice complements the nutritional values of the combined foods. We (R and I) happily consume both white and brown rice with equal relish. Rice can be cooked with almost any vegetable, whole or powdered spices, boiled, baked, steamed, be served as a main course or a side, served plain or turned into the most exquisite pulaos and biriyanis, cooked in spicy flavoured broths, milled into flour and cooked into rotis (griddle baked breads) and pancakes, ground with lentils and made into savouries and breakfast dishes (idlis, dosas, vadais, etc) and used in sweets, desserts and puddings. Growing up in South India (South Indians favouring rice more than their Northern counterparts), rice has been an important part of my growing up. A meal of dal and rice or curry and rice, with a cup of curd (yogurt) is my ultimate comfort food. One of my special memories pertaining to rice was in Zurich. Our friend Peter served us a simple meal of plain rice, salted, peppered and buttered to perfection, along with some sautéed fresh vegetables. I never imagined that plain rice with simple seasonings could taste this good! There are mainly 2 methods of cooking rice. One method is to cook rice like pasta. Boil the rice in plenty of water (salted or unsalted), and when cooked drain the excess water. The other method is the absorption method, wherein you put in exactly the amount of water required to be absorbed to get the correct consistency. This can be a little tricky since one has to keep in mind the variety of rice used, its age and so on. One school of thought says that draining the excess water removes starch and prevents fat accumulation in the body while another says that valuable nutrients are lost with the draining of water. When it comes to plain cooked rice, I’m yet to make up my mind about the two methods and use both methods according to time, convenience and type of dish being made. Different grains of rice require different volumes of water but the basic rule is to use 2 parts water to 1 part uncooked raw rice. Basmati, the king of rice requires much less cooking water, 1 ½ parts to 1 ¾ parts water to 1 part rice usually being sufficient. The rice cooker is a boon when it comes to getting the perfect grain of rice. 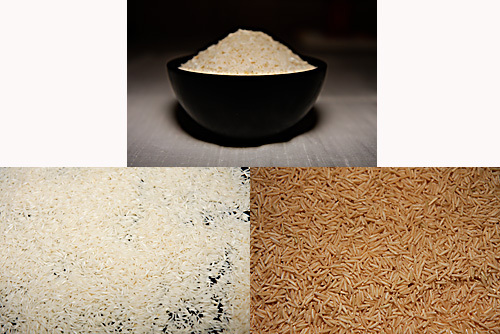 1 part rice to 1 1/2 part water is usually enough for Basmati rice, if it has been soaked prior to cooking. I also follow the general rule of using 1 tsp salt to I cup of uncooked rice whenever I want to salt my rice. When planning a menu, ½ a cup of raw rice per person is another valuable tip that I picked up along the way. Different grains of rice require different measures of water. The recipes below are for Basmati Rice. Once the art of cooking the perfect rice is mastered, one can play around with various spices, herbs and condiments. For instance you could add spices like cumin, cinnamon, bay leaf, clove and cardamom, herbs like mint and coriander or nuts like almonds and cashews. Always use a pot that will be three-quarters full when the rice is cooked as rice expands quite a bit, 1 cup of raw rice yielding approximately 2 ½ to 3 cups cooked rice. Use a heavy bottomed utensil with a well fitting lid for this method. Wash and rinse the rice in a colander in a running stream of water for about a minute or until the water runs clear and soak the rice for 15 minutes to ½ hr, with enough water to cover the rice. Bring 1 2/3 cups water to a boil. Add salt and butter, ghee or vegetable oil. Drain the rice completely with the help of a strainer/colander and put it into the boiling water. Give a nice stir and bring your heat source to the lowest flame/setting. Cover with a tight fitting lid and cook till done. The rice should be cooked in 15 to 20 minutes. When done, open the lid and very carefully and lightly fluff with a fork so as to not disturb or break the delicate grains. Allow the steam to escape for about 2 to 3 minutes. This allows the grains to become firm. Serve hot. Wash and rinse the rice in a colander in a running stream of water for about a minute or until the water runs clear and soak the rice for 15 minutes to ½ hr, with enough water to cover the rice. In a pot or pan, pour eight cups fresh water, 2 teaspoons salt, and a tsp of oil and bring to a boil. Drain the rice completely with the help of a strainer/colander and put it into the boiling water. Cook for 10 to 12 minutes until the rice is tender. Drain and transfer to a bowl. Season with salt, pepper, butter, and olive oil or serve plain with a nice dal or curry. This is one of the easiest and time saving methods of cooking rice. Wash and rinse the rice in a colander in a running stream of water for about a minute or until the water runs clear and soak the rice for 10 minutes to15 minutes, with enough water to cover the rice. The rice grains absorb the water, which prevents them from sticking to one another when cooked. Place all the above ingredients in the cooker and cook till done. This is probably the fastest method, though not as perfect as the other methods mentioned above, although it gives decent results. Wash and rinse the rice in a colander in a running stream of water for about a minute or until the water runs clear and soak the rice for 10 minutes to15 minutes, with enough water to cover the rice. The rice grains absorb the water, which prevents them from sticking to one another when cooked. Place all the above ingredients in the pressure cooker and cook till the cooker gives 1 whistle. Remove the lid after 5 minutes (even if the pressure has not dropped, allow the pressure to escape by lifting the lid with a spoon or else the rice will get squishy). Fluff with a fork and allow the steam to escape for about 2 to 3 minutes, allowing the grains to become firm. Serve hot. Note: A cup of rice should serve 2 people. If cooking for more double the ingredients and cook accordingly. Also, if using medium grained or short-grained rice I use the proportion of 1-cup rice to 2 cups water. No prior soaking is required for medium and short-grained rice. You could also leave out the fat when cooking the rice which will make the grains stick to each other a bit and also alter the taste. This post is a testimony to ur creative abilities and sensibilities. Its just mind-blowing. The pictures, the perspective and the thought. Incidentally, I made my first meal in our new home. Rice, dhal and some plain curd, in the midst of unpacking 45 cartons of stuff. Hi Anushruti, thanks for stopping by my blog. You have an awesome site. Love the pictures. They look soooo professional. Simi: May your new home witness many meals, simple and elaborate ones, cooked by you with devotion and love for all those you cherish. I love the rice I get out at restaurants but mine never tastes right. This post will be very helpful. Wow, Anu. I didn't know there was so much to making rice. Thanks for the enlightening write-up. Cheers. that first photo is simply beautiful. i love the styling. Thanks for that info, very interesting. I get bored of plain rice but i'm not very skilled in the kitchen. There's a lot of easy ideas at this rice recipes homepage I found that you might be interested in too. There is another method which I use frequently – the microwave method. Wash the 1 cup rice – add 2 cups water – microwave it for 15 mins flat. Tried and tested so much that now my 12 year old daughter can also make them. Soumya: Thanks for your feedback. According to Ayurveda brown rice is heavier to digest than white rice. Usually in any Vedic ceremony only white rice is used and has been so from the past thousands of years. 🙂 Brown rice was looked down upon as inferior just as jaggery was looked down upon as inferior to white sugar in olden days. 🙂 Notions which have been discarded by the present generation and beliefs that we now scoff at. I used to like only white rice too but have now come to enjoy brown rice as well. Suchi: I do not use a microwave oven at all.